We are so excited to FINALLY share with you all that we are happily and also nervously expecting our BABY #2 in January!!! We are unbelievably so lucky and blessed that we are able to get pregnant again. Jeet and I have always dreamt of having 2 children. I wanted Kiara and the other baby to be close in age, so I made myself prepared for the second one as soon as Kiara turned 6 months old. Jeet already left to USA and I am still back here in India for few more weeks. We can't wait to find out if we are going to have another baby girl or a boy. So I will get to know the gender once I am back to USA. I am going crazy whether it's going to be a girl or a boy either way, I think it would be so cool to watch Kiara grow up with a little baby sister just like me and my sister... But then again, it would be so much fun to have a little boy in our home and to watch Kiara take care of her little brother. Either way, I just feel so greatful to have a baby again. Putting the gender aside, I am actually more curious to see what it is going to be like living in a household with Two kids!! I have soo many questions in my mind already, may be you guys can help me out along the way?? For example like what happens when Kiara goes to bed and the other baby wakes her up? I am sure this might happened to most of you all! Or what if they both want me at once? I know there are so many families that have 2 or more children. but I already find it to be way too busy with just one. Just can't imagine how things will become more busier!! I am damn sure most of you are wondering how I have been holding up lately and I have to admit, this pregnancy has been a up and low process for me. 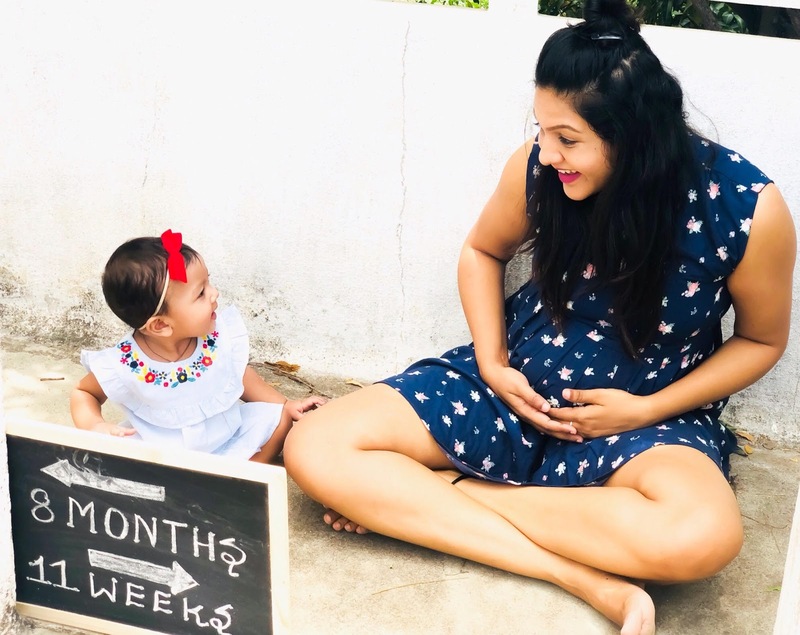 Just like my first pregnancy I have severe morning sickness through out the day and the medication that I am taking here in India is not that effective as the one compared to the medication in USA. I used to take Diclegis drug through out my last pregnancy and must say I was perfectly fine through out. But now until I get back to USA I gotta manage myself with the medication provided here. I can't wait to start blogging more about maternity fashion, look out for new moms and moms to be. Jeet, Kiara and I are way too excited that our family is growing, we can't wait to see how our family dynamics would change and I can't wait to share this new journey of ours with you. Congratulations ! Your post made me smile. Lovely pics. Congrats. I hope the morning sickness gets a bit better. Lovely photos. Yay, congrats to you. These are such beautiful photos. I have two kids, and it's pretty awesome. Granted, I spaced mine out for my sanity. Congratulations!! The second picture is so adorable. Such fun and exciting times ahead of you. Awwwh! Congratulations! You look so beautiful in all the pictures! Love them. Wow, congratulations for having baby number 2. I know there are a lot of morning sickness in your first trimester and I hope you feel better on next 2nd trimester. Congrats on the great news. When baby number two arrives, the family dynamo will definitely change and becomes more challenging. It's also very exciting at the same time. Your beautiful family is growing. I know you are excited and I'm excited for you. I love watching your precious baby grow up and I know I will be equally enamoured with your next baby. Congratulations! That will be so much fun. I can't wait to read along the journey with you. Thanks for sharing! That's so awesome, congratulations to your family! I am eagerly awaiting some fall babies from my family and friends . . . new little ones are the best! Congratulations! So exciting! Hope you are feeling well. I'm coming along for the journey you're sharing! Can't wait to hear (and see) more from you. I am so excited for you guys! I have heard that having children really close together makes things easier! You have some beautiful looks here. Congratulations on your wonderful news! Congratulations! Your daughter is beautiful. I hope your two little ones are best friends! Oh wow congratulations on your pregnancy. Love that your babies will be close in age. Congrats! this is amazing news! another great adventure about to start! and your daughter looking so adorable! Congrats. Babies are such a blessing. I have five kids and always wanted more. Congratulations on your upcoming number 2! I've never had babies, or not any human ones at least. Your first baby looks adorable! Congrats! What an exciting time for you and your family. I wish you a smooth and easy pregnancy! Loved this kind of post. First of all, Congratulation for another great blessing. You really are a lucky couple. Wish you the best on your pregnancy period. congratulations to yuu. i always love to hear baby news. i wish you the best on your journey. Congratulations on second baby, pregnancy is a rebirth for a mother, enjoy your journey and wish you all the best..! Congratulations. Truly a huge blessings for your family. I wish you a smooth and easy pregnancy. Lovely pics! Congratulations! A new bundle of joy to have! congratulations! God bless your cute family with more joy and happiness. The pictures are beautiful. Congratulations! Well my second pregnancy wasn't as hard as my first, because I already have a child as a distraction for all the hardships. LOL. Anyways, better keep a company at home, who can help you with all the chores and can provide support especially when you don't feel okay. So you won't deprive your first child with all the care she needs. Congratulations, that is so exciting! Kiara will be so happy to have a little brother or sister! Congratulations! Kiara is so beautiful and I'm sure the new baby is going to be just as adorable. How fortunate to have your kids so close in age! Congratulations! Having a sibling to share your life and memories with is such a great blessing. Congrats. You're looking so beautiful with your cute baby.!! I am always happy to hear pregnancy especially if the couple are all rejoicing about the new blessing. I pray for your safety and happiness, always. Congratulations! This is so exciting! I can't wait to hear about your pregnancy as you progress! WOW! Congratulation for the second baby. Being a Mom is the happiest moments in our lives.